For those (like me!) who had never heard of watchpapers before, perhaps this blog will help clarify the purpose of these tiny, often exquisite, yet highly practical, works of art. The fine watchpaper recently added to KOAR (2012.4.1) came from a London-made gold watch that contained a stack of five papers. This was the base paper actually in contact with the iron hinge, which visibly stained the paper. (Three of the other watchpapers were from Cincinnati.) It was engraved by David Humphreys, who arrived in Lexington, Kentucky, from Virginia as early as 1788.His brother Joshua, also a clock and watchmaker in Virginia, had apparently arrived in Kentucky in 1780 or very shortly thereafter, but it is unclear if they ever worked together. David Humphreys may have been as well known for his engraving as for his silversmithing. He was chosen to engrave the first Seal for the new state of Kentucky in “An Act of the Kentucky Legislature on December 20, 1792.” Humphreys also engraved the plates of the surveys which John Hughes used to illustrate his “Hughes Reports,” the first publication of the “various decisions by Kentucky’s Supreme Court.” He later “made a Map of the Seat of War 1812-15,” a copy of which was given to the Lexington library by William Levy. Humphreys was still in Lexington until sometime after 1815, although the date of his death or departure from the city is unknown. The first pocket watches seem to have originated in England during the seventeenth century. They were a highly prestigious item, and in America they were taxed by some states. (Solid 14-carat gold was taxed at a higher rate.) Most eighteenth-century pocket watches were “pair cased”, meaning that there was an inner case (or “box”) housed within an outer protective case to prevent dust and moisture from entering through the winding hole of the inner case. The outer case had to be removed in order to wind the watch. Often a fitted silk liner prevented chafing between the two cases. Watchpapers were originally used as a packing between the inner and outer cases to protect the watch’s inner workings. The earliest printed watchpapers appeared around 1760, with most surviving examples dating from the nineteenth century. Watchmakers soon realized they could use these as an advertising medium that would continue to remind the watch’s owner of the watchmaker each time the watch was wound. A watchpaper could be placed inside the case when the watch was sold or when it was subsequently brought back for cleaning or repairs. This also had the advantage of taking up any slack in the case joint due to wear, which gave the owner an impression of a tighter, better fitting outer case. (However too many papers could also cause stretching of the joint, possibly leading to a weakening of the case.) Many watches contained more than one paper, as each repairer usually put their own paper at the top of the stack without discarding those of others. There were perhaps thousands of fancy goods and jewelry stores that performed repair services over the two hundred years pocket watches were in vogue and most, if not all, used watchpapers to advertise themselves. These small circular papers were approximately two inches in diameter. The paper was usually white, cream, buff, orange, blue, green, yellow or rose. Sometimes engravers printed color combinations such as white on silver, gold on blue, blue on gold, or red or green on white. Most of the papers were engraved, although a few were letterpress printed. The name and location of the watchmaker’s shop was on the front, while the price and date of repairs, and even the owner’s name and address, could be noted by hand on the reverse, providing a detailed written record of the pocket watch’s history. The paper itself varied in thickness, but the earliest are on higher-grade and thicker paper. Many were originally produced with small cuts around the edge to allow for a better fit within deeply concave cases. Since sundials were then the only easily available way of finding the correct mean time, the earliest watchpapers included an “equation-of-time” table around the circumference that allowed owners to correctly set their watches. Due to the change of earth’s tilt in relation to the sun throughout the year, the sun is up to about fifteen minutes faster or slower than actual mean time. The table provided the number of minutes fast or slow of mean time that the sun would be for every week of the year. These tables continued to be featured on watchpapers into the nineteenth century. In addition to serving as a practical supplement to pocket watches, eighteenth-century watchpapers can be works of art in their own right and are fine examples of printing at that time. The earliest surviving American watchpaper was likely contained in a pocket watch sold by Samuel Bagnall of Boston around 1740-1741. In 1758, Hugh Gaine ran the first notice of an American watchpaper in a New York newspaper advertisement; other engravers followed suit. Designs range from the naïve, perhaps done by the watch repairers themselves, to the quite elaborate; popular iconography included Father Time, Aurora in her chariot, cherubs, allegorical women, Masonic symbols, hourglasses, clocks and eagles. The constraints of such a small size seem to have motivated many accomplished engravers to new artistic heights. Ironically, while watchpapers were intended to show off the name of the watchmaker or repairer, engravers seldom marked their own names on them, although a few incorporated their name somewhere in the design. 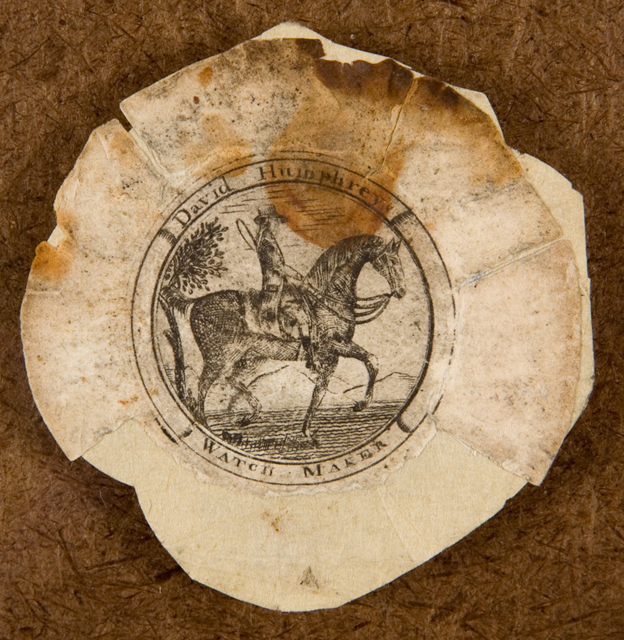 Many well-known eighteenth-century American engravers who printed bookplates also did watchpapers; these included Paul Revere, Peter Maverick, and Nathaniel Hurd. The key-wound, pair cased watch began to be replaced with the newer, slimmer, single cased watches by the middle of the nineteenth century. However, the pair cased watch continued to be produced and sold in some areas (such as Scotland) well into the late nineteenth century, and even into the first quarter of the twentieth century in more rural and farming communities.